A government review will recommend more state school pupils be encouraged to sign up for military cadet training, it has been reported. A civil and military relations review will suggest it could improve attitudes towards armed forces and discipline. MP Quentin Davies, who headed the review, told the Observer the PM was "very keen" on using the cadets more. Tory leader David Cameron, who has suggested a "citizen service" for all 16-year-olds said it was a good idea. Mr Davies, a former Tory MP who defected to Labour last year, told the Observer newspaper: "The prime minister is very, very keen on the opportunities represented by cadet forces." He added: "We will be making a number of recommendations to increase the use of this superb national asset." There are only 60 cadet forces in comprehensive schools in England and Wales, compared with 200 in grammar and independent schools. Last month teachers voted to oppose military recruitment activities in schools if they employ "misleading propaganda". On Monday the Conservatives will outline some of the policies they would pursue in government, to improve school discipline. Asked about the cadet force policy later, and whether he thought it was similar to his own calls for a national voluntary six-week programme for all 16-year-olds, party leader David Cameron said: "It's good there is a free market in ideas." He said he was not calling for a return to compulsory national service but wanted a scheme in which every 16-year-old took part in "community service". 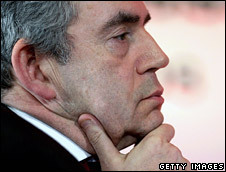 He added: "What the prime minister seems to be talking about, extending the cadet force, I think is a very good idea." Mr Davies said the review was also looking at encouraging the wearing of military uniform by off-duty troops: "There is a definite move back in that direction and there is overwhelming support within the military for this." He is also said to be calling for a re-examination of the way that the military is portrayed in the schools curriculum. A spokesman for the Ministry of Defence said Mr Davies had been asked by Defence Secretary Des Browne to conduct a study "to see how we can encourage the nation to show appropriate recognition for the work of the armed services". He said he could not comment on the prime minister's position, but the review was continuing and "we are waiting to see the recommendations with interest".